The #1 New York Times bestselling series finale and sequel to A Discovery of Witches and Shadow of Night. Look for the hit TV series “A Discovery of Witches” airing Sundays on AMC and BBC America, and streaming on Sundance Now and Shudder. Bringing the magic and suspense of the All Souls Trilogy to a deeply satisfying conclusion, this highly anticipated finale went straight to #1 on the New York Times bestseller list. In The Book of Life, Diana and Matthew time-travel back from Elizabethan London to make a dramatic return to the present—facing new crises and old enemies. At Matthew’s ancestral home, Sept-Tours, they reunite with the beloved cast of characters from A Discovery of Witches—with one significant exception. But the real threat to their future has yet to be revealed, and when it is, the search for Ashmole 782 and its missing pages takes on even more urgency. My favorite book series and Jennifer's narration is absolutely amazing. What a talented person, all the voices she can do makes each character stand out. Amazing! I've listened to the entire series twice now! I absolutely love the narrator, she brought the book to life. Absolutely loved this book, read the whole trilogy, the book had so much to keep you interested, the narrator was incredible!!! Amazing!!! All 3 books were excellent!! I suggest you listen to all of them! 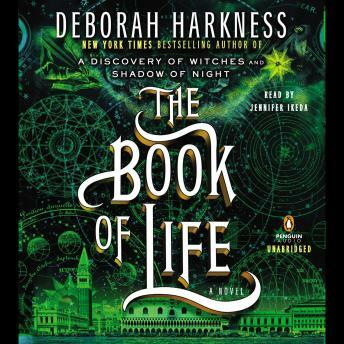 Brilliantly written by Deborah Harkness and brilliantly read by Jennifer Ikeda. You cannot help but be captured by these three books. My wife came very reluctantly to a story about witches and vampires. She does not have a frivolous bone in her body, so fantasy has zero appeal to her. But within the first hour of Discovey of Witches, she was completely taken. Don't miss these books. They are beyond fabulous. I loved it but there were a lot of details that seemed irrelevant to the plot that dragged the book out. This series is my absolute favorite!! The author is obviously a historian. I have literally listened to the series 6 times. The narrator is insanely good. I actually forget it is only one person doing all those voices and accents. Outstanding books and the narrator is an amazing voice actor. If I hear the word blanched one more time I might blanch. It's seriously used every other sentence. And it's impossible to drink as much tea as they talk about. I mean literally she would have to be mainlining tea to consume that quantity. Other than that the book was quite entertaining. Overall, I really enjoyed the series. It was described as a cross between Harry Otter and Twilight. Having never read Twilight, I wasn't sure what to expect. The story was very well written, however, I found the vampire yoga a bit much to swallow. Narration was wonderful.